Hello Sara Luce, first of all, I hope you are well. I would like to tell you how sweet my Angel is, I believe his name is Michele, I understood it from a series of events and coincidences. I have always believed in his presence next to me, I talk to him, I leave the passenger seat free for him by placing my bag in the middle of the two seats, I say hello to him in the morning and I wish him good night every evening. Last night, after having read from your website the testimonial of a lady who had insistently asked her Angel to show her a little frog as a sign of her presence, after I went to bed, I asked my Angel: please my sweetest Angel, give me a sign too, it’s not a big deal if you do not, because I do know that you are here, but it would make me very happy, I beg you, tomorrow let me find a little heart. This morning, at about noon, I started preparing lunch for me and my children, my husband is out all day today, I wanted to make something quick but that at the same time I know my children would like. Battered chicken breasts with French fries. I looked in the freezer and ther were no more frozen fries left. I looked in the pantry and I remembered there was a bag of potatoes left. I took it, I started to take out the potatoes I needed. All of a sudden, what do I see? 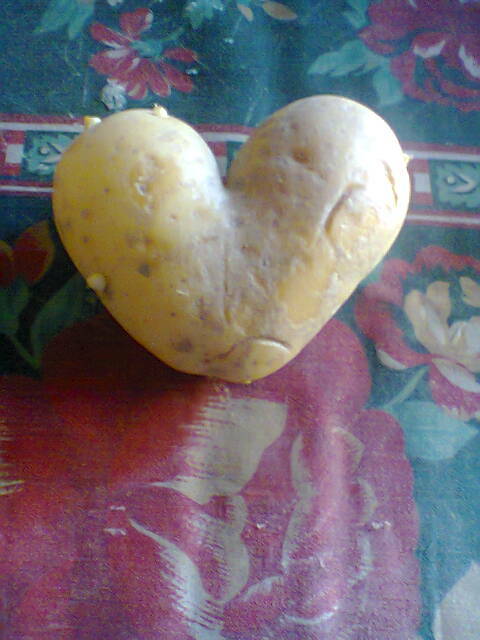 Among the many potatoes, all perfectly oval in shape, or maybe round, I saw a potato in the shape of a perfect heart. I immediately remembered my request to my Angel from the nightbefore. It made me really happy, I was so over the moon! I must have thanked him a million times. That special heart now is on display in my kitchen. I decided to put it in a pot so that something would grow from it and thus give life to another plant. It will be the plant of my Angel Michael. Thank you for listening to me, a big hug to you Sara!